When Montreal ruled the indie roost in the early 2000s, no band was more prolific than Wolf Parade. Rubbing shoulders with the likes of Arcade Fire and the Unicorns, Wolf Parade shuffled seamlessly between Dan Boeckner's foot-stomping anthems and Spencer Krug's jittery, idiosyncratic rock. All the while, the dual frontmen frequently stepped out on their own, churning out album after album with a variety of outfits, a trend that continued after Wolf Parade went on hiatus in 2011. The pair quickly amassed two distinct back catalogues ranging from folktale epics to sleek synth-rock, and plenty in between. Wolf Parade's recently announced reformation, with a slew of summer shows and a vague promise of new material, came in the most Wolf Parade-ian way possible: not only are they reuniting, but three of the four remaining members have new albums out this year. Navigating the band members' extensive, eclectic back catalogues was already challenging enough, and the task is set to be even more daunting a year from now. To make it easier (and to help soundtrack the celebration), here's our Essential Guide to Wolf Parade. There's a potent element of fantasy associated with Krug's work. Many of his songs are packed with references to Greek and Biblical mythology, and Dragonslayer is, true to its name, the "Krug-iest" work he's ever done. The fourth album by Krug's onetime-solo project Sunset Rubdown, Dragonslayer is thoroughly immersed in the lore of legends, with each of the eight songs a winding adventure on their own; together, they make up an album of Odyssean proportions. The tunes are energetic no matter which turn they take through Krug's labyrinth of sonic ideas, bolstered by harmonies between him and Camilla Wynne Ingr. Though some listeners may get lost on the way, the album coalesces in the riff-rocking "Dragon's Lair," on which Krug confronts his demons over the course of the track's 10 minutes. Though it doesn't seem like Sunset Rubdown made it out alive — this was the final track of their final album — it serves as a fitting, legendary funeral. Apologies to Arlen Thompson, Hadji Bakara and Dante DeCaro: the other members of Wolf Parade are mentioned far too infrequently, a byproduct of being in a band with not one but two incredibly prolific frontmen. But they get their due respects on At Mount Zoomer, Wolf Parade's sophomore full-length. 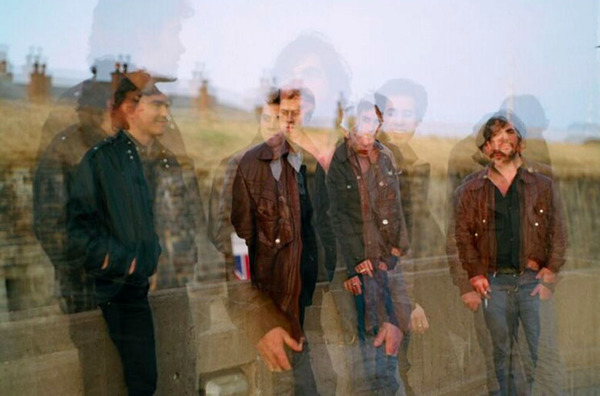 The record doesn't homogenize the members' individual voices and talents, but showcases them all distinctly and synergistically in a way that no other Wolf Parade album does, reconciling the individual characteristics they'd been developing with their other projects in the years since Apologies to the Queen Mary. DeCaro's bass lines, Thompson's production and drumming and Bakara's keyboards are all equally noteworthy and sonically present, which makes for a record that's cleaner than Apologies and jammier than Expo 86. Another testament to the band's teamwork here is Boeckner and Krug's only song together, lengthy closer "Kissing the Beehive," that serves as the band's most ambitious work. For an outfit who teetered on the precipice between guitars and synths, Sound Kapital is not Handsome Furs' most balanced record: that honour goes to their second album, 2009's Face Control. But by pushing the guitars aside and focusing on synths, Boeckner and then-wife Alexei Perry put out a sleek, polished pop album that still carries their wild, in-your-face energy that emerged over the course of their previous records — look no further than lead single "What About Us," which builds into a synth-y whirlwind that is anything but forgettable. What ended up being Handsome Furs' swansong turned out to be deeply prophetic: in its opening moments, Boeckner declares, "When I get back home, I won't be the same no more." He emerged from the throes of Sound Kapital fully changed and, as his later work with Divine Fits and Operators has shown, sounding much more brazen and confident as a result. Though Dragonslayer may be the record that best embodies how listeners perceive Krug as an artist, it's Sunset Rubdown's second album that perhaps best shows how Krug sees (or, at least, saw) himself. The first Rubdown album with a full band, Shut Up I Am Dreaming doesn't weave itself into existing mythological landmarks; here, Krug showcases his wild imagination but grounds himself with the weight of reality. Though he dreams of flying, Krug is no Icarus; instead he thinks and sings, with a childlike sweetness, of insecurity, revenge and sacrifice as he explains the minutiae of adulthood that often goes untold in adult lessons. He spares little detail about life's gruelling difficulties, and the arrangements reflect that, bundling burdened, maximalist rock with jumpy, jaunty keyboards and glockenspiels. Over the course of an album, Krug builds a mythology of his own, crafting a coming-of-age album that explores the facets of life that others don't dare discuss. In 2005, Wolf Parade finally released their debut album after staggering through the path to get there. A haphazard band assembly, a series of EPs, a drunken night aboard the album's namesake cruise ship and two different recording sessions left the band exhausted and emotionally raw. You can hear it on Apologies to the Queen Mary, on which the band express a ragged sense of jubilation, via raised-fist rock hooks, that still holds up as one of the crown jewels of Montreal's indie rock revolution a decade later. In our 2005 Wolf Parade cover story, we said, "it's no longer obvious which songs are Spencer's and which are Dan's," and, in hindsight, it's this statement that identifies the album's immediate and lasting success. While later releases bear the individual members' distinct elements, Apologies is much more cohesive, but with songs that still have their own sonic identity, an album that stands alone from the members' past and future works. Rifling through fatigued ballads ("Modern World" and "Same Ghost Every Night"), enduring anthems ("Shine a Light" and "This Heart's on Fire") and heady sing-alongs ("You Are a Runner and I Am my Father's Son," the incredible "Dear Sons and Daughters of Hungry Ghosts," and "I'll Believe in Anything"), Apologies to the Queen Mary is unapologetic in its emotiveness. After the high-pressure nuclear fusion that brought them together, Apologies seamlessly melds some of modern music's most unique, creative voices for an unbridled celebration of feeling — something, anything, everything. Wolf Parade's early EPs (2003 to 2005), while possessing strands of their later potential, are best left for completists, with the best tracks being reworked and polished into top form for Apologies (with the exception of "Dear Sons and Daughters," which works amazingly well both in its rougher, extended form and the shorter, cleaner album version). Krug's Sunset Rubdown debut, Snake's Got a Leg (2005), is a similarly scattered collection of sonic scraps, also with some rough gems in there. Clearly Krug thought so, too: all its best ideas were refined and reworked for later releases. On paper, Swan Lake looks like an indie rock dream come true: Krug, former Frog Eyes bandmate Carey Mercer and Dan "Destroyer" Bejar — three of Canada's most distinct voices, in multiple senses of the term — coming together like an art school Voltron. But their debut, Beast Moans (2006), suffers from too many cooks in the kitchen and overlapping, half-baked visions (follow-up Enemy Mine (2009) is a slightly more cohesive improvement). Krug's Moonface has been a series of closed-term experiments where Krug will take an instrument (often in the piano family) and create an album around it. But though Krug shines where he is given a wide sonic palette to work with, these Moonface albums are oftentimes repetitive and tedious — with some exceptions, which we will get to. Atlas Strategic, Boeckner's early 2000s rock outfit, was important in shaping his career — the band's success landed them an opening slot for Modest Mouse and introduced them to lead singer Isaac Brock, who later signed Wolf Parade to Sub Pop Records and co-produced Apologies — but the band's skronky sound lacked the propulsive urgency that made Boeckner's subsequent work so compelling. The third (and, presently, latest) Wolf Parade album is 2010's Expo 86. The record features the most distinct divide between Boeckner and Krug's tracks, which may have subconsciously foreshadowed their then-impending hiatus. Many tend to love either Krug's yelpy operas or Boeckner's anthemic rockers, but rarely both (for this writer, it's Boeckner's songs that really stand out here: "Little Golden Age," "Ghost Pressure" and "Yulia" are a trifecta of Springsteenian perfection). For more of Boeckner's best, keep going with the first two Handsome Furs records, Plague Park (2007) and Face Control (2009). Though he later polished his sound (but never his howl), he and Perry handled the more discrete moving parts well. Venturing through Handsome Furs' abrupt breakup, Boeckner teamed up with fellow raspy indie rocker Britt Daniel (of Spoon) as Divine Fits, and their only album, A Thing Called Divine Fits (2012), is great for fans of both acts, reintroducing swaggering rock elements to Boeckner's increasing synth fascination. Divine Fits bridges the gap from Handsome Furs to Boeckner's current project, Operators; their sole release so far, EP1 (2014), streamlines Divine Fits' lean, mean, synth-rock sound with a punk-like sensibility. Time will tell if the project's upcoming Blue Wave LP will continue this trend. With Krug, Sunset Rubdown's self-titled EP (2006) and third album Random Spirit Lover (2007) enforce the project's high-art mania. Though it's nowadays easy to forget that Krug first burst onto the scene as Frog Eyes' keyboardist, the piano remains at the core of his music, an early exploration of his classical roots can be heard on Fifths of Seven's sole album, 2005's beautiful Spry from Bitter Anise Folds, a sound he recently touched on (now with vocals but minus the strings) with Moonface's Julia with Blue Jeans On (2013), an album of solo piano ballads and his starkest, rawest work to date. But it's not just with the piano on which Krug shines; also worth visiting from his Moonface project is Heartbreaking Bravery (2012), a collaboration with Finnish post-rockers Siinai that finds the two meeting in the middle for a lean, cohesive album of atmospheric rock tracks. The two forces will be teaming up again for a new release later this year. Not to forget the rhythm section, Arlen Thompson has production credits on many of the albums listed here (and played drums on Arcade Fire's seminal "Wake Up"), and Dante DeCaro's singular, self-titled album with Johnny and the Moon is a pleasant alt-country record. Plus, "On the Loose," DeCaro's only release under his own name, heralds good things to come from his upcoming solo debut.